In 1964, a feature appeared in the Chicago Tribune, “A Billion Barrels of Bourbon”, profiling American Distilling Inc.’s business in Pekin, Illinois. This kind of article had not appeared in the American press for a long time, if ever. A generation had to pass after Repeal for the detailed workings of a whiskey distillery to be acceptable, even tempting, public fare*. The article has the stamp of the consumer society. Increasingly, buyers of liquor wanted to know who made their brands and how. By 1964, consumerism was an indelible part of the business and social fabric of North America. We have seen how Consumer Reports, the product-rating magazine and service, helped pioneer this approach. It got its start in New York City in the late 1930s. I discussed also how a New York newspaper set up a product testing institute during the first world war and ran pieces analyzing and rating everything from soup to near beer. It was run by a former government mandarin who was the right-hand man (woman, actually) of the famous Dr. Wiley, author of legislation designed to protect buyers of foods and beverages. The trend was also noticeable in the form of burgeoning food and wine columns post-WW II, wine clubs, books such as Ralph Nader’s Unsafe At Any Speed or Rachel Carson’s Silent Spring, and Julia Child’s and Graham Kerr’s first tv shows. Ridgely Hunt was a Trib writer and editor. The piece is very amusing with many arresting turns of phrase. Apart from being better written than most beverage alcohol journalism today, a similar piece could appear with virtually no change, despite that is the 50 years gone by. All his central points: examining the source of a well-known product, delineating some history, interviewing management and workers, explaining the production method, are today stock features of food and beverage writing. There are antecedents to articles such as these stretching back to the 19th century – lengthy pieces describing visits to London’s porter-breweries, for example. But by 1964, in the flush of America’s business expansion of the 1950s, the template was perfected and hasn’t changed much since. 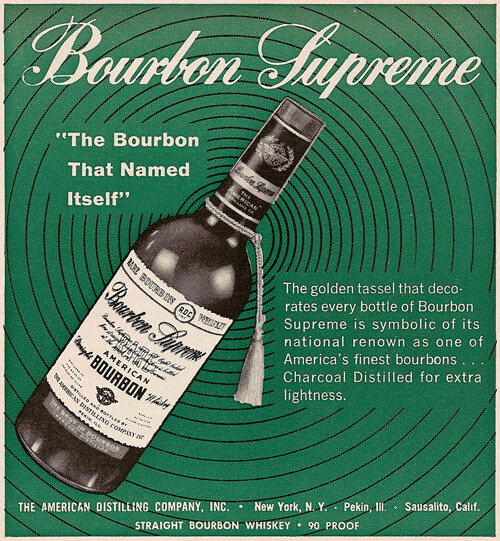 The head honcho of American Distilling explained that its flagship product, Bourbon Supreme, was light-bodied in keeping with the post-war trend (one that would continue until about 15 years ago). A photo-illustration speaks of a second distillation stage involving charcoal, and period ads also mentioned this apparently unique feature. It seems to have been more than merely dumping powdered carbon in the finished spirit, but anyway people seemed to have liked the results. The brand still exists, owned by Luxco, a well-known non-distilling producer. I am not sure it is still marketed but I recall seeing Bourbon Supreme on the shelves about 10 years ago. Of course by then, it was made by another distiller, probably Heaven Hill of Bardstown, KY. The Pekin distillery still exists, it is partly owned by MGPI, a midwestern distillery known for its distillery in Lawrenceburg, Indiana, a producer of bulk whiskeys (and other alcohol). However, the Pekin plant today makes no whiskey. It produces industrial, fuel-grade, and beverage-grade alcohol, the latter presumably for vodka. The earlier history of American Distilling Inc. is well-described in this blog entry from American historical whiskey blogger, Jack Sullivan. “Distillers today maintain a feverish affability, as if an ingratiating manner might ward off the ghosts of the Volstead act”. “[It comes] in nine appalling flavors including lemon, grape, and coffee”. “Orange gin including new flavor”. Note re image: the image above was sourced from Vintage Booze, a repository of classic beverage labels, here. All trade marks or other intellectual property in or to the image belong to their owner or authorized licensees. Image believed available for educational or cultural purposes. All feedback welcomed. *In the early 1950s an article in Fortune magazine, well-known to bourbon historians, profiled Jack Daniels. It presented many of the features of the Chicago Tribune story, but was less broad-based so to speak and after all appeared in a business magazine, not a family newspaper.